CALABASH, NC – Right up front I need to tell you that one of my most memorable rounds happened at Crow Creek. Three summers ago my 11-year old grandson and I played alternating shot at Crow Creek in the Father Son tournament. Although we didn’t seem to make a putt, our ball striking was outstanding. In a difficult format we made a major charge up our flight’s leader board. This golf course is always in great shape. The bermuda grass fairways are well maintained and the rough, although difficult is cut fairly. The L-93 bent grass greens are receptive, but can harden in the afternoon. Designed by a former Jack Nicklaus Design associate, Rick Robbins, and opened in January 2000 the course is very attractive. There are no gimmick holes, forced carries or tricks at Crow Creek. Both the fairways and greens are large, but don’t let a pretty face fool you. Five sets of tees will provide a challenge for every level of golfer. From the white tees the Par 72 layout rates 68.8/121 at 6099 yards. The blue tees jump to 6679 yards and a rating of 71.7/127. Although a straightforward, playable golf course, there’s plenty for every golfer. From the white tees the Par 3s are there for the taking. From the blue tees add 20-30 yards. However, from either tee club selection is critical. Getting close is imperative. A two putt is a good thing on any Crow Creek green, but particularly on the Par 3s. No. 8 is one of the prettiest holes in the Myrtle Beach area. A tee shot over water needs to avoid the large native cypress tree that protects the green. No. 13 is the shortest hole on the golf course, but again two putts is a good thing. The Par 4s at Crow Creek standout having few similarities and a variety of tests. After a fairly easy opening hole, No. 2 immediately serves notice you’re on a real golf course. A long sand hazard protects the right side of the fairway. A fairway bunker at the elbow protects the left. Two putts for par is a good thing. On the backside No. 11 is a pretty hole with water and strategic bunkers, but birdies are there for well-placed shots. The Par 5s are fair and playable for both the big hitter and those of us that are distance challenged. No. 3 at 471 yards from the white tees is reachable. However, the average player still has only a wedge to be putting for birdie. No. 18 is a nice Par 5 finishing hole. A good drive and a downhill second shot will leave a short iron into a green well protected by traps. A good score is certainly obtainable and guaranteed to keep you coming back. 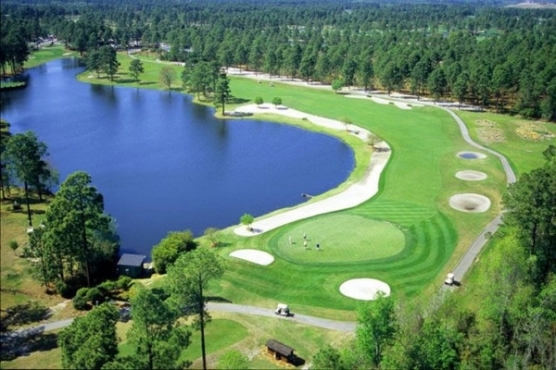 Crow Creek Golf Club is located just two miles from the SC/NC state line on US 17. A very accommodating and welcoming staff and a truly memorable golf course make Crow Creek a perfect addition to your Myrtle Beach area golf vacation.